You might think that as a home inspector I have some kind of special immunity to house problems and concealed damage, but I don't. I have my own share of homeownership woes and unexpected surprises. 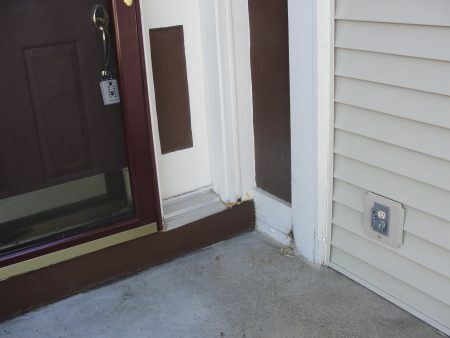 The ASHI Home Inspection Standard of Practice specifically excludes concealed damage, and I have a short story I'd like to share that helps to explain why. 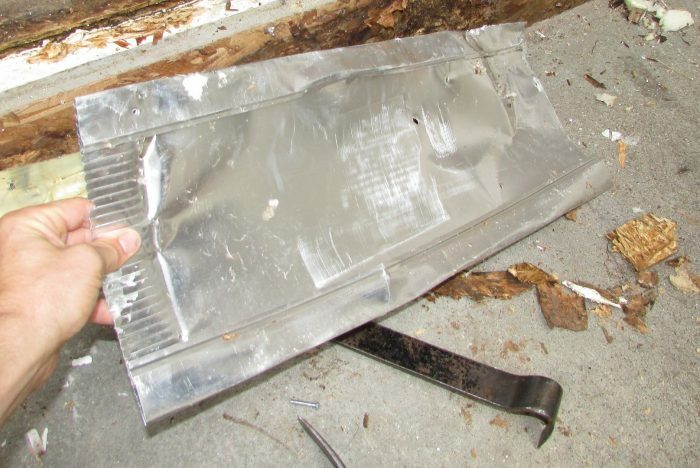 This story also allows me to explain how I recently found an old metal dryer duct used as pan flashing for my front door. 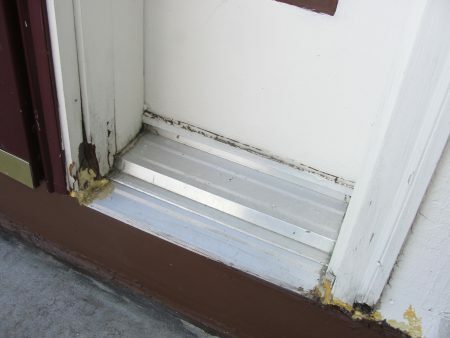 When I bought my 1998-built home nearly six years ago, I remember finding a fair amount of rot around the front door. As you might imagine, this immediately caught my eye when I walked up to this house for the first time; quite welcoming, right? The rot in this area was mostly the result of a couple of roof lines concentrating a lot of water to one area on the roof, and all of that water coming right down onto the front stoop. 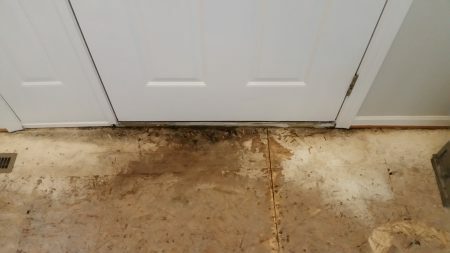 Every time it rained, water pounded the concrete in front of the door, causing water to splash up against it. As I've said many times before, water splashing up against a house is bad news. A previous owner tried to fix this by adding a plastic gutter to catch most of the rainwater. That surely helped, but a wide plastic gutter strap was positioned in just such a way that a lot of water could still run right over the gutter and splash onto the concrete. I fixed the water management issue by having new aluminum gutters installed, and I replaced the rotted trim and brickmold around the front door. For the rotted areas on the door frame, I used Abatron's LiquidWood & WoodEpox Wood Restoration Kit. This is a two-part system that works very well for spot repairs. Once I had all of the rotted wood treated and filled, and the wood filler meticulously sanded to match the profile of the door and painted, you never would have known there was an issue. It remained that way for many years, but there were still other problems with this door that I wasn't aware of. Just a couple of months ago, my wife and I decided to replace some of our flooring because it was looking pretty rough. 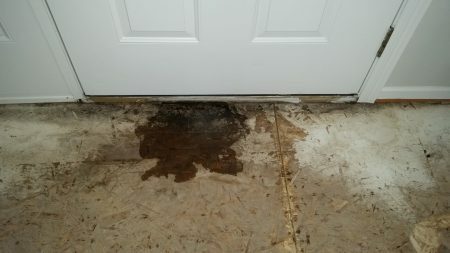 After my wife removed the super-cheap hardwood flooring in our entryway, we discovered that the front door still had issues, as evidenced by a large area of water-stained subfloor, pictured below. Just to make sure that this wasn't a flashing issue above the door, I sprayed a little bit of water against the door from outside. Water quickly leaked in from underneath the door threshold. Bummer, huh? I probably could have gone crazy with a bunch of caulking and hoped for the best, but there was surely a lot more concealed damage below the door, and I didn't want to just bury it. My solution was to remove the front door, replace part of the rotted rim joist, and install a new door. While removing the old door, I learned part of the reason that the old door had leaked so badly: there was no pan flashing of any sort installed. There was just a bunch of expanding foam and some pieces of bent-up dryer duct material, presumably to be used as flashing. This was someone's idea of how to prevent water leakage below the door. What could possibly go wrong? For the new installation, I used flexible window flashing tape to create a waterproof barrier below the door, and lapped that over a piece of galvanized steel flashing that I left exposed below the door. If any water ever makes its way through the new door, it's going to have nowhere to go but back out. For information on how to properly flash a door, check out the instructions on the JLC website. The new Masonite door from Pete's Prehungs & Millwork will never rot. The exterior trim and jamb is completely wrapped in aluminum, making for a residential door that rivals commercial durability. In conclusion, this was concealed damage that had being happening for a long time. Even after I thought that I had fixed the problem, water kept coming in. If you're a homeowner, you will incur unexpected expenses. There is simply no getting around that. Tune in next week for more concealed damage and home inspector homeownership woes; my dad has a story to tell about a nasty odor in his basement and how he had to rip his wall apart to fix it.